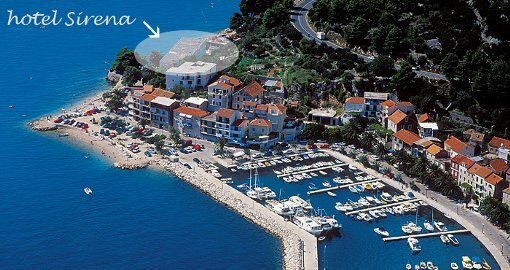 Situated between azzure waves and a mountain of Biokovo in the western part of picturesque village of Podgora, 300 m frome town center, only a few meters away from the beach lies Hotel Sirena. A 3-star hotel, with 45 doublebed rooms, sea view balcony, 24 doublebed rooms french, window garden view and 3 family rooms on three floors. 100km away from the Split airport, 160km away from Dubrovnik, the UNESCO world heritage. Our hotel are designed to offer a warm welcome and a pleasurable stay, rooms boasting a fantastic sea view, AC, Sat TV, telephone, mini-bar and Wi-Fi. Parking available upon request. We invite you to come and experience a delightful atmosphere in descreete elegancy of our bar and restaurant and enjoy warm hospitality of our stuff. Open pool is equipted with deckchairs, if you desire to have a late morning coctel on our terrace. In near future hotel Sirena opens a wellness to make your stay even more complete.